Italy has staged a U-turn on the issue of creating “loyalty shares” by Italian companies after pressure from some of the world’s largest institutional investors. The decision was seen as a sign of prime minister Matteo Renzi’s openness to foreign investment. The step comes as Mr Renzi seeks to boost foreign investment to help pull Italy out of its triple-dip recession. It is also the 40-year-old reformist leader’s second strike against Italy’s corporate arcane governance rules in as many months as the government is already seeking a shake-up of its hidebound mutual banks sector. The decision over so-called loyalty shares follows an open letter this week from more than 100 investors including Fidelity, Aviva, Threadneedle Investments, Schroders and UBS, academics and board members who had called on Mr Renzi to strike down a provision supporting the creation of multiple voting rights at Italian listed companies which they said made Italy hostile to foreign investment. Read more here. Two very different companies made significant announcements last week. National Grid, the UK utility company, said it would no longer issue formal quarterly reports — an important piece of news for its investors, who took it in their stride. The next day, Apple gave its regular quarterly update. Investors sent the company’s share price soaring after learning that strong holiday sales pushed it to the largest profit of any public company in history. The investors’ reactions raise two questions. Is the economy better served by frequent corporate reports, or by statements when meaningful events occur? And does the timing of reports contribute to short-term attitudes among investors and corporations? Read more here. 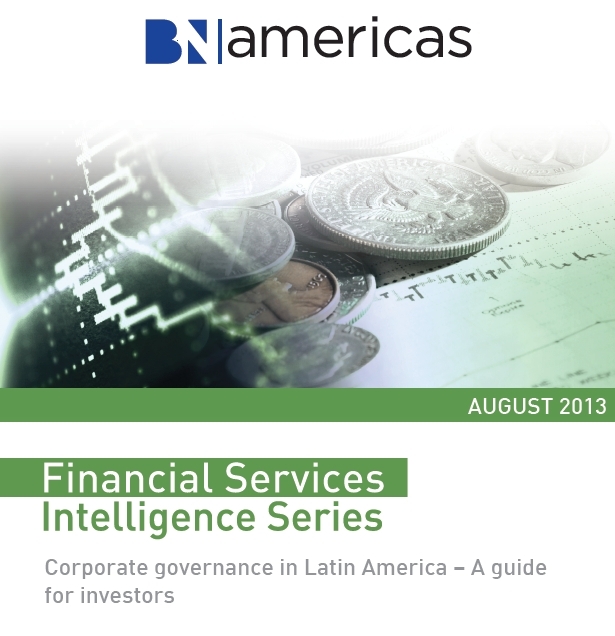 As part of their Financial Services Intelligence Series, BNamericas has launched the publication “Corporate governance in Latin America – A guide for investors” by Andreas Grimminger. The report includes quotes and contributions from Latin American corporate governance experts Sandra Guerra, Santiago Chaher, Francisco Prada, among others. To access the report you must click here and be a BNamericas subscriber. A new report from IFC and the World Bank finds that Corporate Governance Indices (CGI) can raise a country’s overall corporate governance standards and can offer companies possible financial and investment benefits from corporate governance improvements. 1. Corporate governance indices can be an effective market solution in addressing legal and regulatory gaps, and in enhancing corporate behavior and company’s visibility. 2. Evidence suggests that indices based on binding listing rules allow greater access to capital than those based on corporate governance codes or other scoring mechanisms. 3.Investors recognize the importance of corporate governance in their investment decisions, and the difficulty in gathering related information, especially in emerging markets. If set up correctly, CGIs can address that information gap. 4.Given the qualitative nature of CGIs, investors need to properly understand the building blocks and methodology an index is based on, as information and expectation asymmetry may pose unforeseen risks. 5. In most CGIs, key challenges for investors remain: access to index information and rating methodology is limited, and company evaluations are rarely made public. The world’s largest investment funds – including pension plans and mutual funds – should adopt a code of conduct to ensure they will wield their growing power appropriately in a new “age of the institutional investor,” according to Stephen Davis, a leading governance advocate. The Harvard University professor spoke Tuesday at the annual meeting of the Canadian Coalition for Good Governance (CCGG), telling Canada’s largest institutional investors that governments have increasingly shifted power to major investors in the hope they will police the capital markets. The problem with this “big bet,” he said, is that most funds are not equipped to do so.